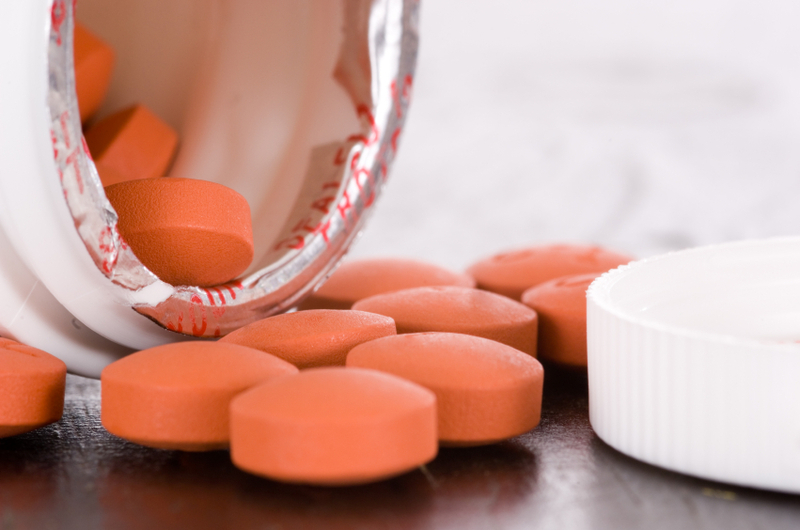 Home » Pain » What Are the Side Effects of Ibuprofen? When many Americans experience pain, they often turn to pills for relief. Ibuprofen (1) is a non-steroidal anti-inflammatory drug (2) —better known as an NSAID. It’s typically used to relieve inflammation, swelling, or pain from arthritis, back issues, minor injuries, headaches, toothaches, menstrual cramps, and fevers. The trouble is that ibuprofen side effects are quite common. When it comes to heart attack risk, high doses of ibuprofen are even considered as dangerous as Vioxx, which is no longer for sale due to potential safety concerns. So what are the alternatives to ibuprofen? Luckily, there are a number of natural ways to relieve pain without a prescription or a trip to the drugstore. If you do take ibuprofen, what is the proper dosage (3)? Ibuprofen can be used by adults and children that are at least six months of age. It’s best to take ibuprofen as directed on the label, or as prescribed by your doctor. Ibuprofen should also not be taken in large amounts, or for longer than the recommended time period or dose. 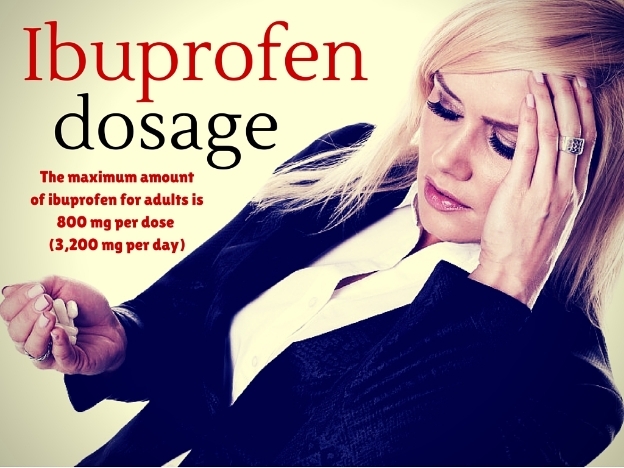 The maximum amount of ibuprofen for adults is 800 milligrams (mg) per dose, or 3,200 mg per day. Side effects of ibuprofen at 600 mg are usually minimal, and smaller amounts are generally best for pain, fever, or swelling relief. Side effects of ibuprofen at 800 mg may be greater, but check with your doctor to be sure. 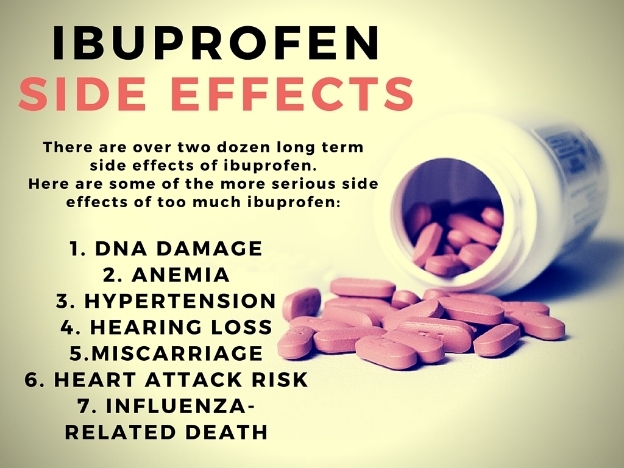 In a study published in the journal The Lancet in 2013, researchers found that long-term side effects of ibuprofen and other NSAIDs include an increased risk of heart attacks. Ibuprofen is also thought to increase the risk of stroke, especially when you have heart disease, or if it’s used long-term and in high doses. It’s best to ask a doctor whether ibuprofen is safe for you, especially if you have high cholesterol, heart disease, or have a history of heart failure. Results published in the journal Drug and Chemical Toxicology in 2012 indicate that ibuprofen is capable from inducing genotoxicity in bone marrow cells of mice (5). Genotoxicity is a term that describes genetic mutations, or DNA damage, which can possibly lead to cancer. In the study, ibuprofen was given orally to mice at doses of 10, 20, 40, and 60 mg per kg of body weight. NSAIDs such as ibuprofen can lead to red blood cell damage, according to a study published in the journal Pharmazie in 2002. This damage can lead to anemia. Ibuprofen is also thought to have mild hypertensive properties. In a study published in the Journal of Hypertension in 2008, blood pressure (6) increased in 393 osteoarthritis patients treated with 600 mg of ibuprofen three times per day when compared to lumiracoxib 100 mg once daily. The long-term side effects of ibuprofen also include hearing loss. A study published in the American Journal of Medicine in 2010 found that NSAIDs like ibuprofen would increase the risk of hearing loss in men (7). For the study, the researchers examined the link between self-reported professionally diagnosed hearing loss and the regular use of NSAIDs in 29,917 men aged 40 to 74. Overall, 3,488 cases of hearing loss were reported. A systematic review and meta-analysis published in the Journal of the Royal Society of Medicine in 2010 suggested that randomized placebo-controlled trials of NSAIDs like ibuprofen can lead to death related to influenza (8). The risk of miscarriage is thought to double when taking NSAIDs like ibuprofen in the early stages of pregnancy, according to a study published in BMJ in 2011. The researchers identified 4,705 cases of miscarriages under these circumstances, and cautioned against the use of NSAIDs during pregnancy. 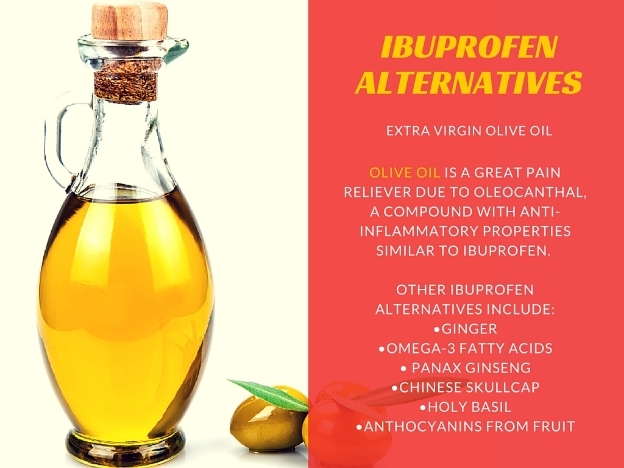 There are some alternatives to ibuprofen for pain relief that are considered to be more effective in treating pain (9). The following are the top 10 natural alternatives to ibuprofen. Ginger is well known as an effective substitute for ibuprofen. In a double-blind comparative study published in the Journal of Alternative and Complementary Medicine in 2009, ginger was as effective as ibuprofen in relieving menstrual pain in women (10). In the study, 150 women with menstrual pain were divided into groups. One group took 250 mg capsules of ginger rhizome powder four times daily for three days after their periods began, and another group took 400 mg of ibuprofen capsules. Omega-3 fatty acid sources (11) such as fish oil are well known for their anti-inflammatory properties. In a study published in the journal Surgical Neurology in 2006, an intake of 1,200 mg daily of the omega-3s found in fish oil was found to be a safer alternative to ibuprofen for neck or back pain in arthritic patients. Other good sources of omega-3 fatty acids include flaxseed, flaxseed oil, and fatty fish such as salmon, mackerel, or trout. In a study in the journal Food and Chemical Toxicology in 2008, Panax ginseng (12) was found to display pain relief and anti-inflammatory effects similar to ibuprofen. As a result, Panax ginseng may be a potential ibuprofen alternative for arthritis patients. Olive oil (13) is a great pain reliever due to oleocanthal, a phenolic compound (14) with anti-inflammatory properties similar to ibuprofen. Oleocanthal prevents the production of both the cyclooxygenase-1 (COX-1) and cyclooxygenase-2 (COX-2) enzymes (15); pain and inflammation are reduced when these enzymes are blocked. A compound in Chinese skullcap called baicalin (16) was found to reduce pain similar to ibuprofen in a study published in the journal Anesthesia and Analgesia in 2003. A study published in the journal Phytomedicine in 2000 found that holy basil contains compounds with a similar anti-inflammatory activity to ibuprofen. Holy basil contains anti-inflammatory compounds such as apigenin, isothymonin, eugenol, rosmarinic acid, isothymusin, cirsimaritin, and cirsilineol. Vitamin C (17) is known to reduce inflammation and strengthen connective tissue. In a study published in the journal Phytotherapy Research in 2011, the combination of vitamin C, ginkgo biloba, and astaxanthin was as effective as or better than ibuprofen for reducing respiratory-related inflammation. Anthocyanins are extracted from fruits such as sweet cherries and raspberries. A study published in the journal Phytomedicine in 2001 found that anthocyanins from raspberries and sweet cherries were as effective as ibuprofen in reducing COX-1 and COX-2. It’s a good idea to make necessary dietary changes to combat inflammation and pain, which is what leads to ibuprofen use in the first place. For instance, removing certain pro-inflammatory foods can help, such as dairy, wheat, gluten, and nightshade vegetables. Replace those with anti-inflammatory foods such as garlic, cauliflower, broccoli, and flaxseeds. It’s also good to detect food sensitivities with bio-meridian testing, a meridian stress assessment test, or bioanalysis with bioenergetic testing. This will reveal possible triggers of pain. There are also several homeopathic remedies that can help relieve pain. The most common among them is arnica montana, which is often used for bruises, back pain, arthritis, and any other condition where ibuprofen may be used. A study published in the journal Rheumatology International in 2007 found that topical arnica was as effective as ibuprofen for osteoarthritis of the hand (18), but with fewer side effects. Other homeopathic remedies used for pain relief include bryonia alba, nux vomica, causticum, calcarea carbonica, cimicifuga, belladonna, and rhus toxicodendron. Other possible ibuprofen alternatives include methylsulfonylmethane (MSM), glucosamine sulfate, turmeric, S-adenosyl methionine, bromelain, boswellia, white willow, and other antioxidants such as vitamin A, vitamin E, zinc, and selenium. Ibuprofen side effects can be common. To recap, the most common side effects of too much ibuprofen include constipation, bloating, dizziness, mild heartburn, headaches, vomiting, and nausea. It’s wise not to take ibuprofen if you are sensitive to NSAIDs, or have a history of heart failure, peptic ulcers, kidney problems, asthma, liver problems, hypertension, angina, peripheral arterial disease, or stokes. A number of medications are thought to interact with ibuprofen, such as anti-inflammatory painkillers (19), antihypertensive medications, aspirin, digoxin, lithium, methotrexate, tacrolimus, warfarin, selective serotonin reuptake inhibitors, and antidepressants. So it’s important to remember that ibuprofen alternatives include ginger, Panax ginseng, omega-3 fatty acids, and holy basil.